At my house, no one will eat leftovers - but I don't mind using leftovers to make cards. Especially when they are some of my FAVORITE ones. These papers, ribbons and flower are left from my class at The Crafty Scrapper last weekend. I was unpacking and decided I could use them just one more time and come up with something pretty. You can see that the card is just pieced together, and the ribbon and bow are glued on. 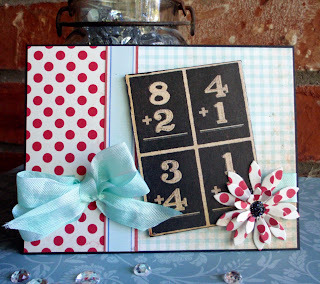 The flower is cut from the MFT Stamps Upsy Daisy Die and has a little black Stickled center. The only thing new is the little focal piece. It is just cut from paper and then mounted on chipboard. I am working on a fun project using more of these little addition flash cards. I can hardly wait to show you! Tomorrow I am going to share with you another product I just found that is SOOOOO helpful in making these die cut flowers. I will be back to show you then. Get ready - you are going to want one!